Xarus and the vampires continue their war on mutantkind with X-Men #2. The issue starts with Wolverine and Colossus tracking down one vampire, who mysteriously doesn’t burn up in daylight. Storm zaps him, and he leads them to a whole den. Blade shows up and starts killing all of the vampires, but Wolverine explains that they need one alive. He then explains to them all about the light bending tech in the amulets, as well as the fact that Dracula is very dead. Dr. Nemesis examines Jubilee, who feels this intense desire and doesn’t feel like fighting it. Cyclops has a meeting with most of the major X-Men, plus Blade, and informs them that Dracula is dead. Then we cut to Xarus with his minions. Jubilee was the target of that bomb, and once she comes to them, the X-Men will send a certain mutant after her. 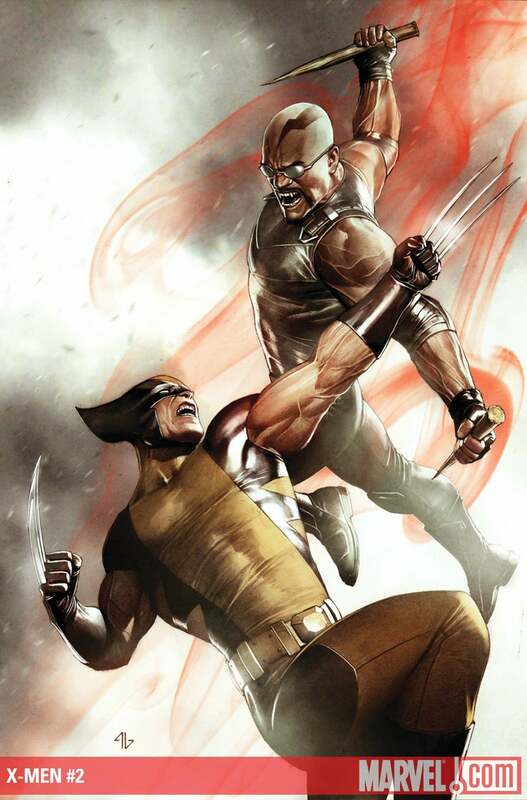 Once that certain mutant becomes a vampire (probably Wolverine), they’ll all turn. Jubilee knocks out Dr. Kavita Rao, who was taking a look at her after Dr. Nemesis left, and rushes to the mainland. Blade explains that Xarus has united the vampires, and that makes him all the more dangerous. Madison Jeffries reconfigures Cerebro (I thought it was Cerebra) to detect vampires. And there’s a damn lot of them in the area. Jubilee arrives at Xarus’ headquarters while Emma Frost offers a solution: resurrect the devil they know, Dracula, and use his anger at those who killed him to their advantage. Blade and Storm try to convince Cyclops that it’s a bad idea, but Wolverine says that there’s no other option for so many vampires. So the X-Men gird themselves to retrieve Dracula’s body while Xarus feeds on Jubilee. As with the first issue, a resounding meh. Really, the Curse of the Mutants is Marvel cashing in on the current popularity of vampires, using an experienced vampire writer, Victor Gischler, to do so. Unfortunately, Gischler’s not so good with the main characters. Dr. Nemesis is a bit too… nice, for one. And some of the characters just act odd, like Angel not understanding what “the devil you know” means. And what was that Saddam Hussein/Adolph Hitler line about? Not the best analogy. It’s clunky dialogue like that that hurts this issue most. Gischler has a decent grasp on the characters, but considering how generic Matt Fraction makes them all in Uncanny X-Men, it’s disappointing that he doesn’t offer a sharper alternative. The story itself is decent, but Gischler never tries to take it a level up or anything. Like he thinks that the story itself is so exciting that it doesn’t need to be written excitingly. The best part of the issue is, once again, Paco Medina, who’s come leaps and bounds since he began drawing for the X-Men line. He’s a very solid artist, and he renders all of the characters quite well. His version of Blade looks like he has a bit of a pedo mustache, but that’s really all. And in this issue, he manages to mimic another artist for one panel, as Cyclops in the top panel of the last page looks almost like Leinil Francis Yu drew him. Eerie. Anyway, really good art and a vampire premise aren’t enough to justify this title. I hope this series gets another writer after Curse of the Mutants is over so it can really take off.